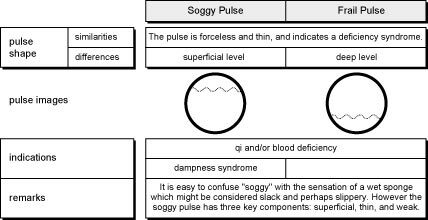 Indications: deficiency of yin, yang, qi, or blood: if deeper, more yang deficiency, if pulse lacks root, more yin deficiency. Explanation: the frail pulse is thin. This is a deficiency of yin or blood. The frail pulse is forceless. This is a deficiency of qi and/or yang. The frail pulse is also deep, that suggests a lack of upward movement, leaning toward a yang deficiency. Next: you’ll need to focus, because it’s the scattered pulse.